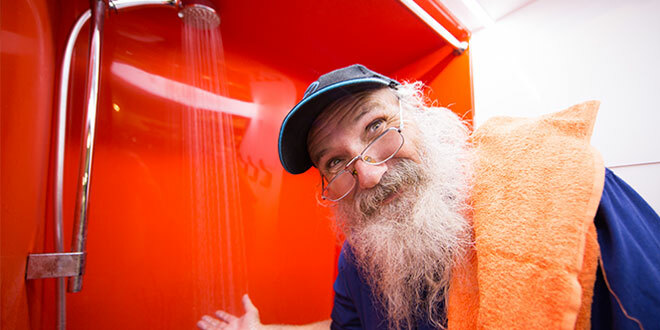 Clean trial: Dave “Bushie” Brum inside Orange Sky Laundry’s first mobile shower for the homeless. Photo: supplied by Orange Sky. SCHOOLMATES operating the world’s first mobile laundry service for the homeless before knowing how to run a load have now rolled out a portable shower. Former St Joseph’s College, Gregory Terrace pupils Nic Marchesi and Lucas Patchett, who were named the 2016 Young Australians of the Year, launched their first mobile shower van in Brisbane today. It will mean free access to a hot shower in Brisbane from the city’s homeless, which the co-founders say is a basic human right. “Being clean restores self-esteem and confidence, but the positive conversations and interaction our volunteers provide for our homeless friends is another important thing Orange Sky Showers can offer,” Mr Marchesi said. “Being clean and feeling connected with the community is a basic human right. 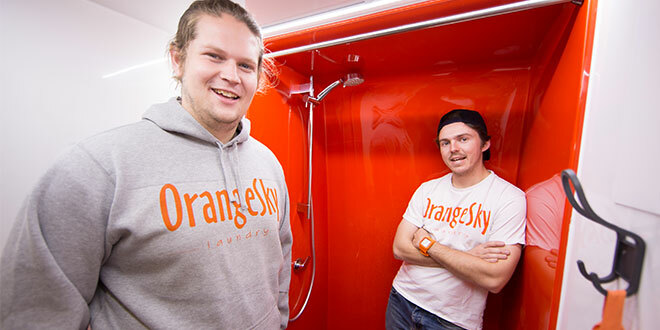 Ingenious idea: Brisbane’s homeless will have access to a free hot shower under a portable shower trial with Orange Sky duo Lucas Patchett and Nic Marchesi. Partnering with The Shine On Foundation, Melbourne, the Orange Sky team will trial the shower van throughout Brisbane before stationing it permanently in Melbourne. The mobile shower van follows a fleet of 10 laundry vans that have been serving Australia’s homeless since 2014. Mr Patchett said the idea to provide portable showers for the homeless was among the first questions people asked when the Orange Sky team first started. “The Shine On Foundation were the first people to believe in us to enable our service to diversify,” Mr Patchett said.